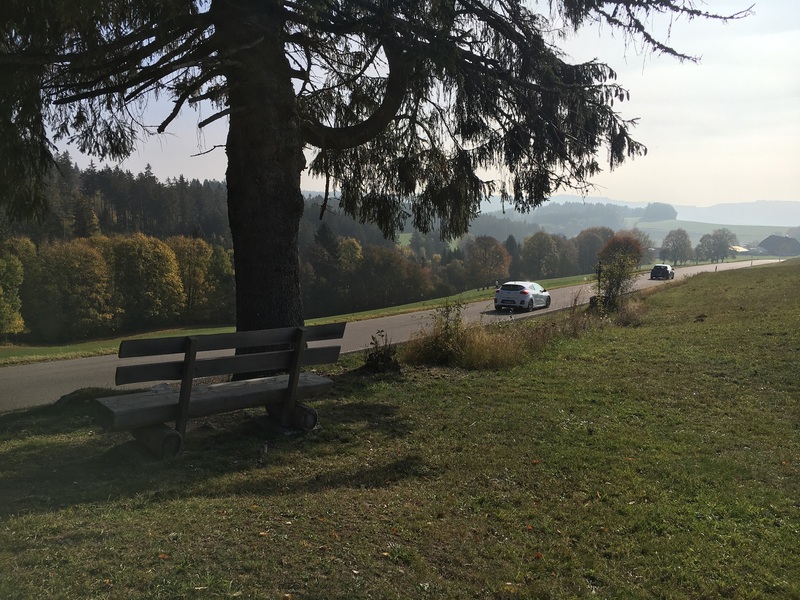 As I mentioned in chat I rented a 18 1200GS and rode from Kaiserslautern Germany to the Swiss Border (350km) and then back over the weekend. Generally when I'm in Germany and have a weekend free I rent a bike and ride - but this time I had a wingman. Jerry jumped on the trip... he's a coworker who sold his 999 earlier this year and is thinking about a Multi - and he didn't take much convincing. He grabbed an F800GT and we headed out Saturday as soon as the fog burned off enough that we weren't going to end up soaked (about 10:30am). Since I humped my gear around airports I just brought the minimum - Helmet, gloves, jacket... so that meant cold legs early and late as overnight temps were in the single digits C. (High 30's low 40's). Have to give a shout out to the BMW Motorrad folks in Kaiserslautern. Easy folks to work with and got us two nice bikes without much notice. 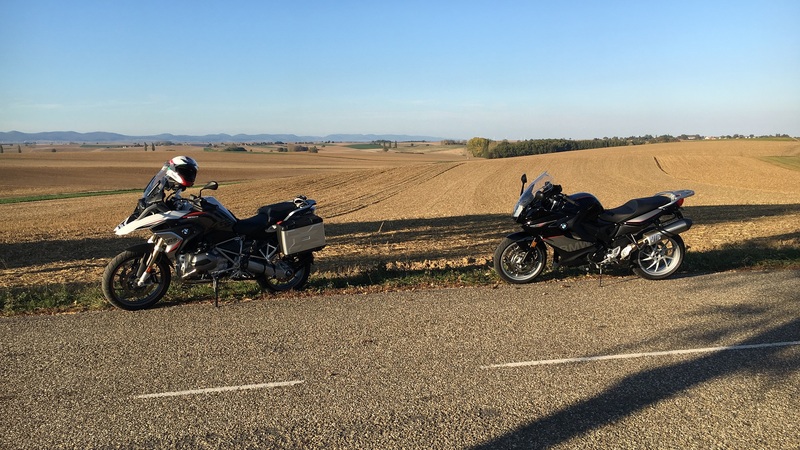 We rode through Eastern France both days... our first leg stretch was outside of Shoenenbourg in Alsace - which is the town my family was allegedly "asked to leave" about a hundred and fifty years ago - necessitating our move to the US. scott and nzdave like this. 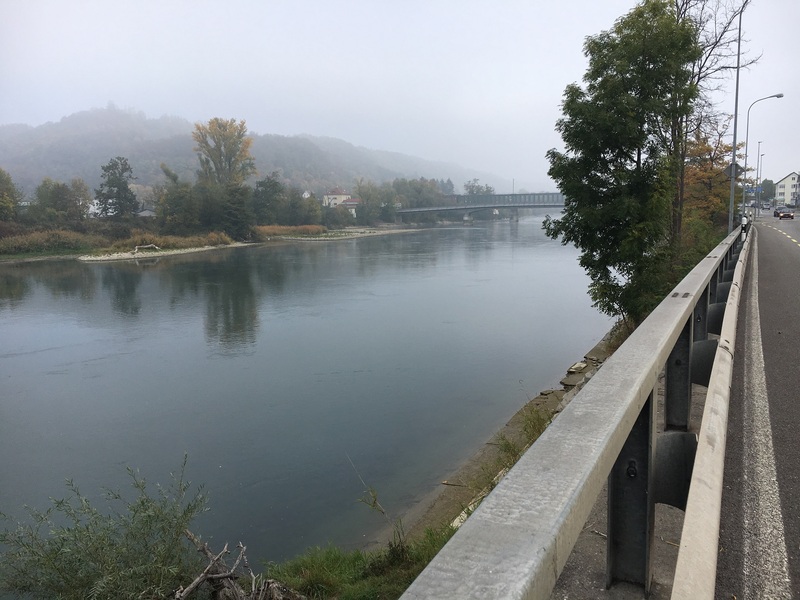 We didn't take a lot of pics on Saturday because it was so foggy all day... but we did get a chance to grab a few when our first 'alternate route' selection about an hour South of Baden Baden ended badly. 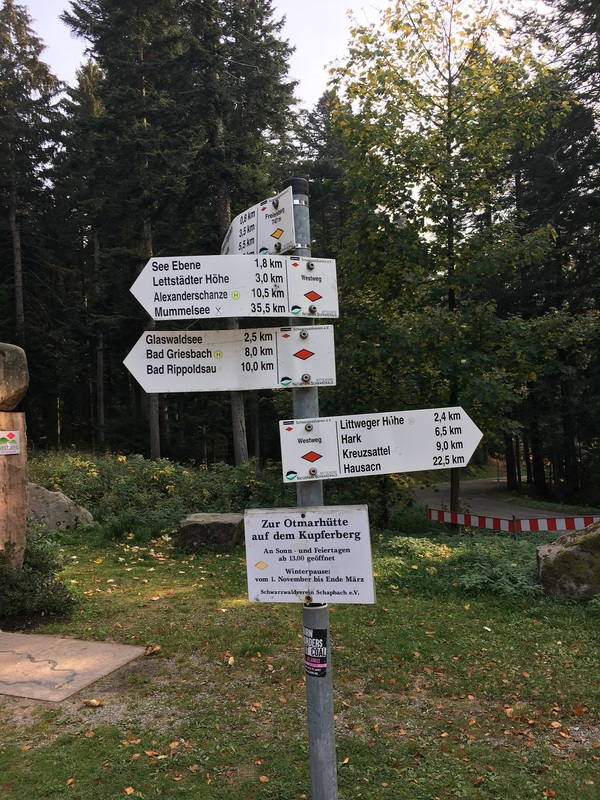 Turned out the location was a hiking intersection in the Black Forest. We saw a LOT of hikers all weekend and every parking area was near capacity. however... there was some great riding as the B500 was mostly dry and the other off-track diversions we took all worked out... including a great little 20-30km section along a stream at the end of the day as we approached Swizerland) that was wall to wall tight twisties (reminded me of TotD but without the hairpins - just short weaving twisties). 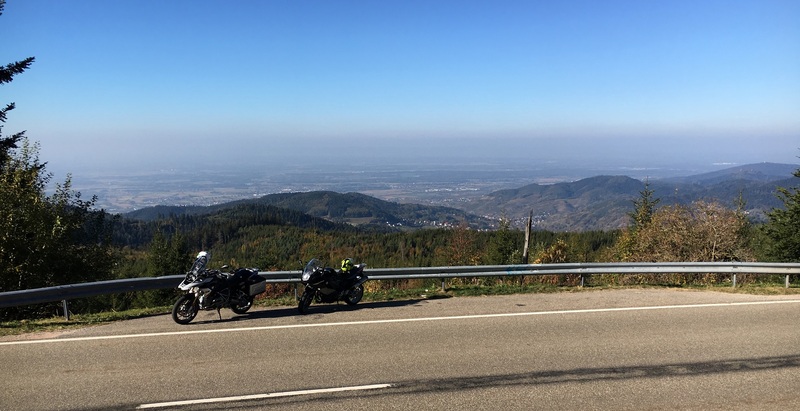 The bikes were both issue free and fun riding - though we did get passed regularly by Germans on go... we were consistently running at the speed limit (varied between 31 and 62mph for the most part) and the Germans were passing us like we were in park. 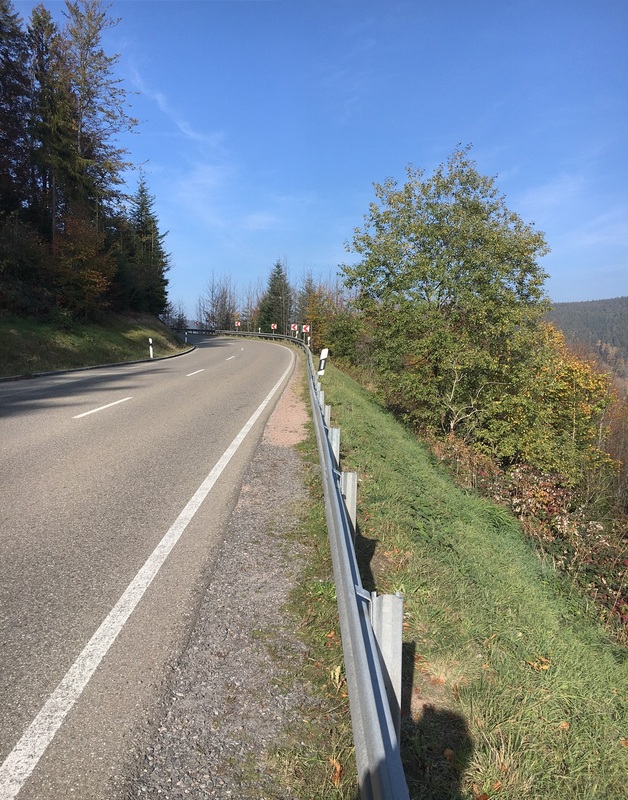 Unlike the US where the nanny state has to set limits so low you'd be hard pressed to get a decent lean in - the speed limits were generally high enough that you were definitely paying attention to keep yourself out of trouble. Last edited by DaveK; Oct 22nd, 2018 at 9:52 am. On Sunday the morning started near freezing with heavy fog... by the time we finished breakfast it was about 9:30 and the fog had lightened A BIT. 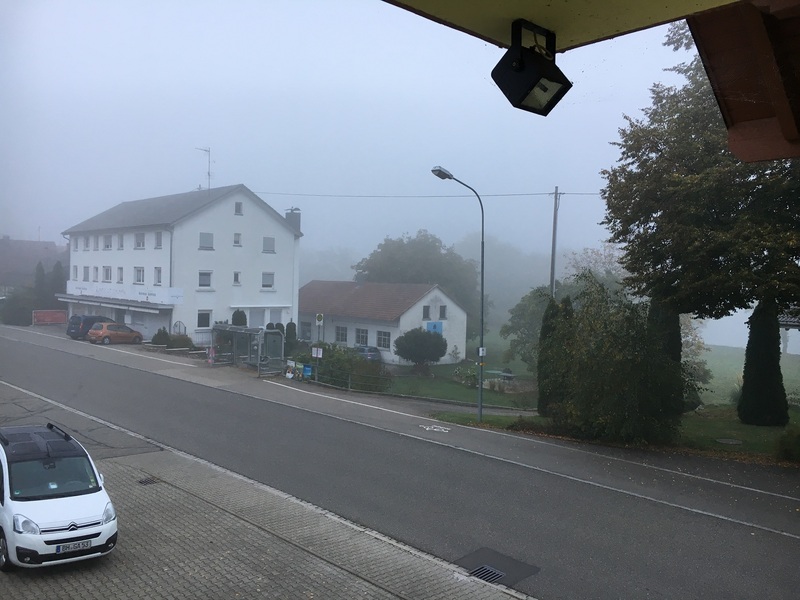 In this pic from the Hotel, the Rhine is just behind that building... you can KINDOF see it in the middle right next to the tree base. 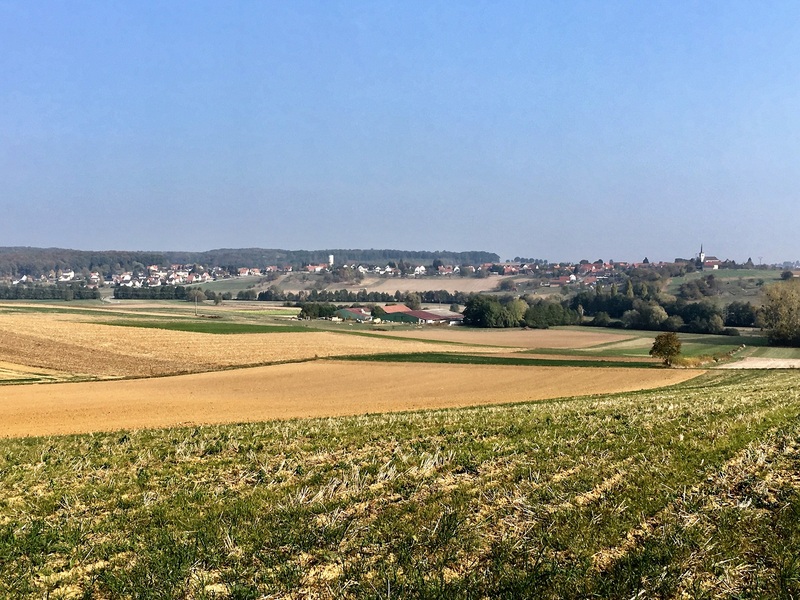 As we climbed out of the Rhine valley back north we escaped the fog pretty quickly and the day turned beautiful again... and the riding almost immediately became excellent again (maybe 30 minutes into the trip we were back in the twisties and stayed there much of the day). Last edited by DaveK; Oct 22nd, 2018 at 10:01 am. Last edited by DaveK; Oct 22nd, 2018 at 10:10 am. 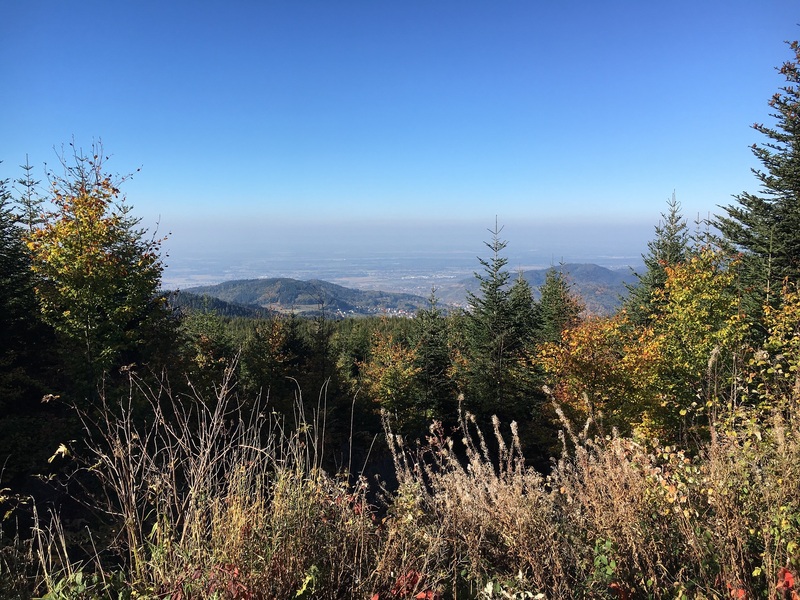 And here's a view into the plain to the West of the Black Forest (some Germany, some France). It wasn't long after this that we got ourselves off track. 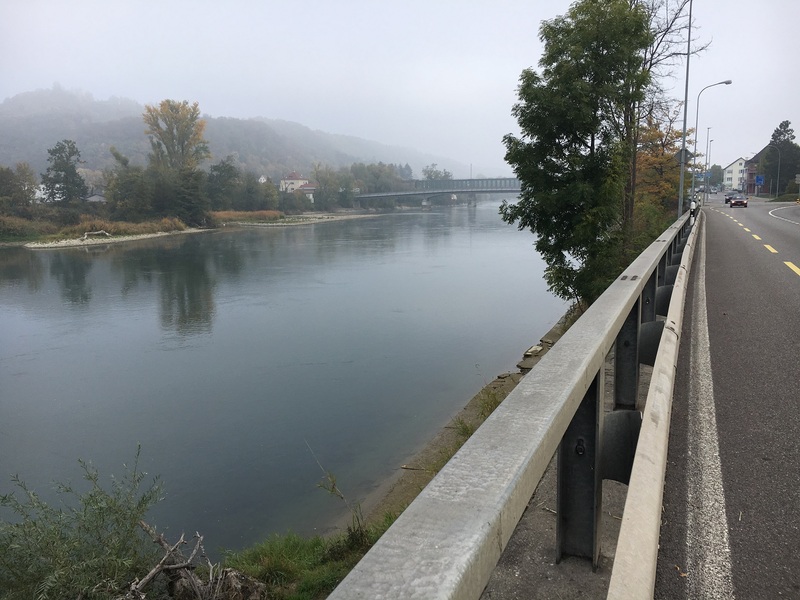 I'd forgotten to shut off 'autorecalc' on my Garmin and I was riding the F800 at the time (the GPS was on the GS) so Jerry just followed it down off to Offenburg. We ended up taking the A5 for 12 miles or so (at 100mph... 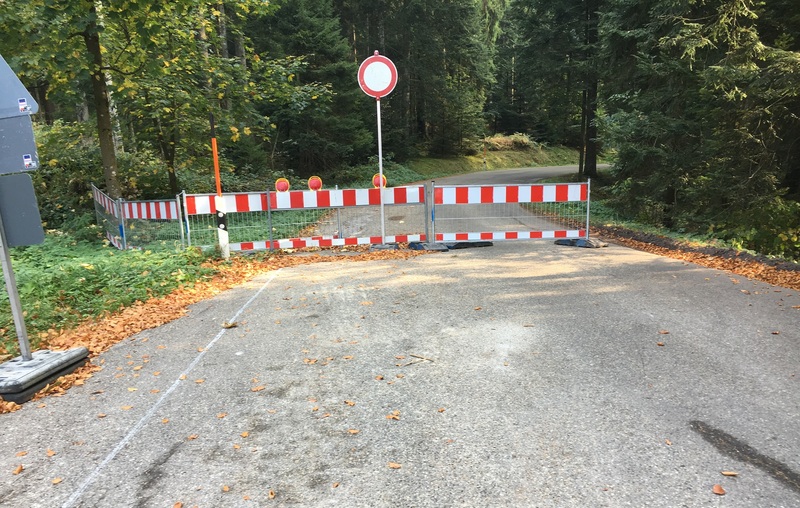 autobahn!) and then climbing back to the B500. Sadly there was an accident not far north of that (they had the road closed and a chopper... so it was bad... but the guy was at least still alive) so we had to divert around it (which was some fun decend/ascend twisties that looks like a triangle notch to the left of the B500 on the track). 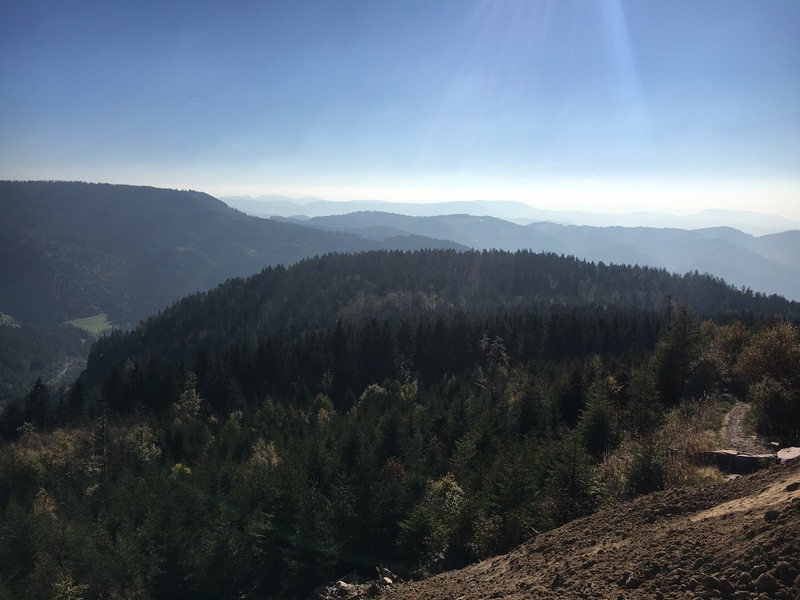 And then it seems like not long after that we were back in France and nearing KL... even though the Alsace region doesn't have the vertical of the B500 area... it was surprisingly fun and we got some pretty great pics there too. Not long after we got back to Germany it started getting dark... and cold. It was back under 10C when we reach Kaiserslautern - so our timing was good... it was getting cold. Last edited by DaveK; Oct 22nd, 2018 at 10:38 am. I rode the GS for most of the trip but got some time on the 800GT on Sunday. The GS was very much 'a GS'... basically identical to the 16 I had last time with a few small but positive updates. The first was the TFT display... while I don't like the arcade game like visuals, the display was MUCH brighter and crisper than my Multi display - it was easy to read even in direct sunlight and was made of something more durable than the transparent butter they use on ours. The second was the quickshifter. In 2016 I think the quickshifter was new - and it was crap. It worked OK if you were hammering it but any other time it was stiff and jerky - basically useless. Even worse... it interfered with other shifting (like clutchless/rev matched shifting). The 18 quickshifter worked nearly all the time and was relatively unobtrusive (I could rev match shift smoothly, I could clutch shift smoothly, etc...) The only time it was unhappy was if you wanted to blip down but were at low rpms and throttle... which is a dumb time to try blipping down anyway. Only niggle is that the shift sensor for the quickshifter is very compliant and makes the shifter feel mushy - I didn't like that. I also was struck by how heavy the GS feels compared to my Multi... it has decent acceleration (but lacks top end - maybe the 1250 helps there) but while the bike feels relatively light and maneuverable at low speeds (for its size), at higher speeds it's weight becomes more apparent (and it's not THAT much heavier than the multi). Turn in and transitions are LETHARGIC... but the bike sticks like glue and tracks nicely through corners. In contrast, the F800 felt nimble, planted, and asking for more aggressive cornering when I rode it. It was definitely faster through the twisties even if it lacked the thrust down the straight. 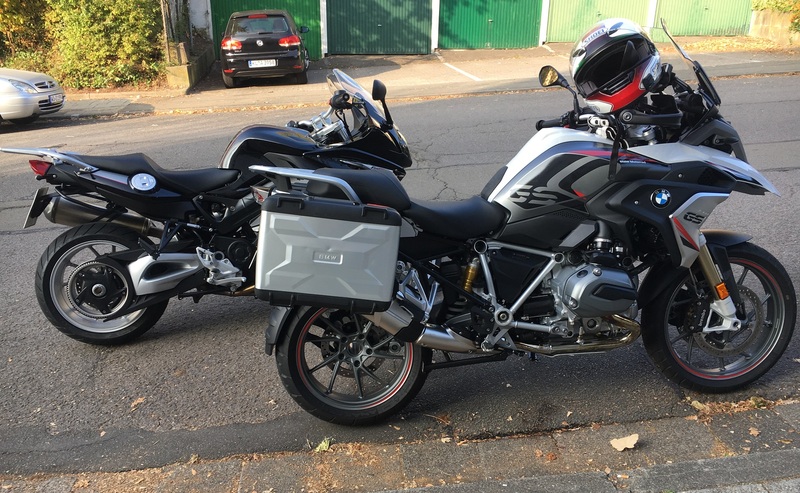 Of the two bikes, the 800 felt more like my multi handling wise (maybe the BST's have more impact on handling on my bike than I was giving them)... the GS felt more like my brothers super tenere. But that's why I get the GS - it's a more 'stately' machine and I tend not to be tempted to get into trouble... I could get into trouble on the 800. 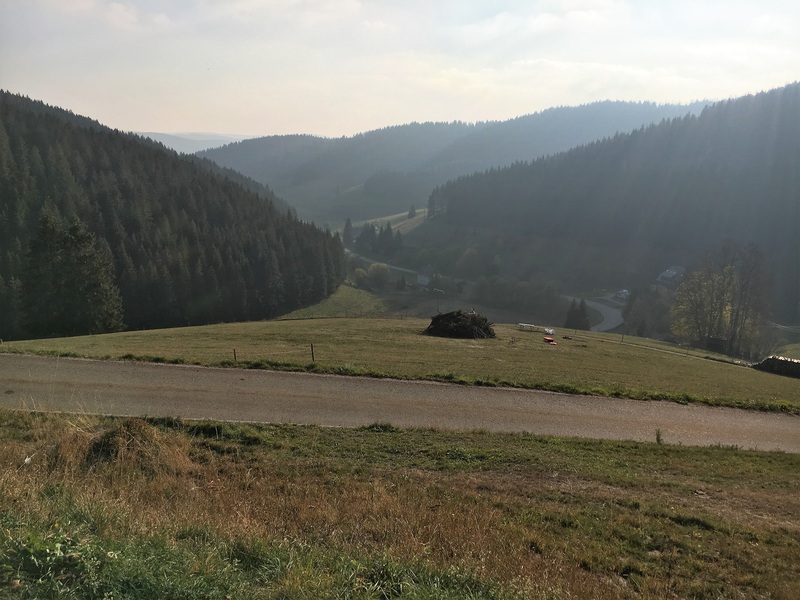 So my comments on the B500 and the Black Forest area of Germany - some of the best riding in the world - with a few caveats. One is the traffic... next time I'm doing it during the week... LOTS of traffic. On the plus side, nearly ALL Germans drive/ride like maniacs, and the one's that don't aren't insulted when you filter by them or pass them. Another is the weather this time of year... damp spots and occasionally leaves on the road - had to keep an eye out. Also... short days and cold morning/nights but that's not that big a deal... we had a good 7 hours of riding both days (ended up at 750kms). 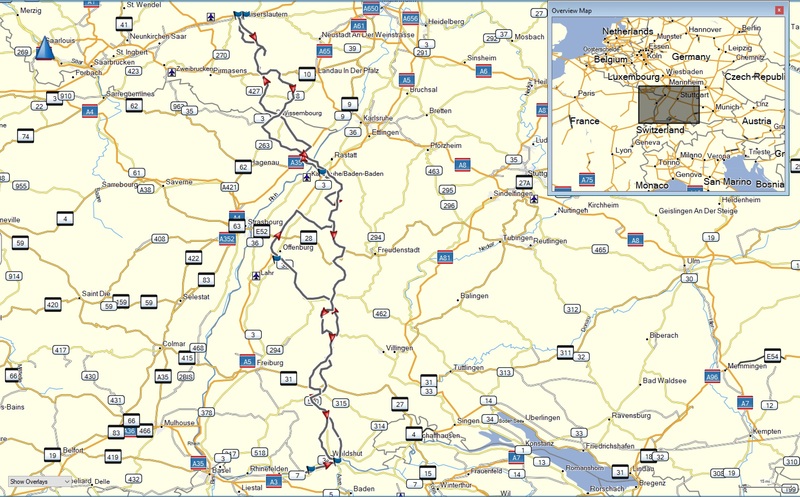 There was a really nice mix of mountain riding (steep, switchbacks, tight twisties), rolling hill riding (long fast twisties on flawless tarmac), and even some tail of the dragon crazy tight and technical stuff on nearby alternate roads. The area felt to me like they took some of the best riding in the US and packed a lot of the diversity into an area of 250 miles by 80 miles. The B500 should absolutely be on every riders 'to do' list. scott, nzdave and Micah.Berry like this. Last edited by DaveK; Oct 22nd, 2018 at 10:50 am. Great postings and story, thank you for sharing Dave. 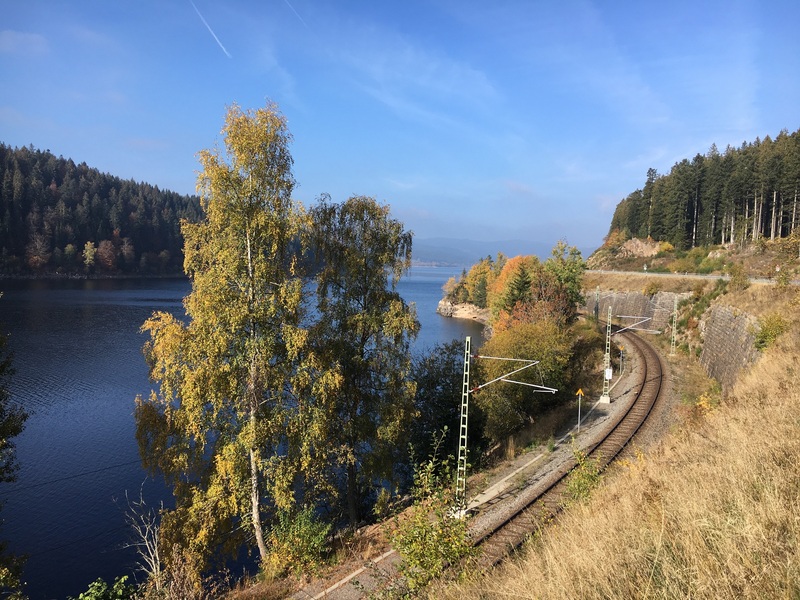 Great ride report! Thanks for letting us tag along there. Just what I needed to remind me I need to plan another 2 wheeled adventure! 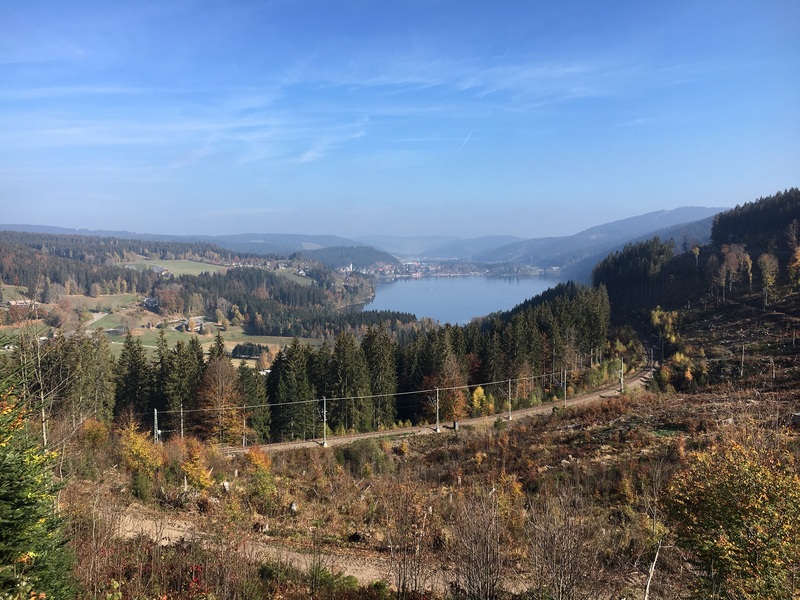 I was in the black forest a few years ago for work but didn't get the opportunity to ride. Next time, I'll be making a stop for a bike rental!